Thanks for a great recipe idea! I made these this morning and they came out pretty good. My only real change to the basic recipe was I ended up using right at 1 cup of peanut butter. I think some of the issues people are having relates to what brand of peanut butter they are using. Some are thicker than others, more or less sweet and more or less salty. I used Jason’s Natural and it has no added salt or sugar. Even though I used roasted/salted peanuts as one of my additives the mixture was still a little bland so I added a bit of salt – that enhanced the sweetness (think salted caramels). My additions were chia seeds, pumpkin seeds, chopped roasted peanuts, slivered almonds and a small amount of semi-sweet chocolate chips. I pressed these down HARD into the pan. They held together fairly well – one corner bar crumbled when I cut it but the others stayed pretty solid. How long would you let them cool before cutting into squares? I just tried this and although i did add in more honey and pb, they still came out dry. so bummed. i’ll still snack on the pieces – guess this was a trial run. will make these again another time. I’ve made these several times and have definitely had to add more pb and honey but… granola bars are supposed to be kind of dry and not terribly moist, right? I put this recipe into my Myfitnesspal recipe log. No extra add ins..just basic recipe using honey. 16 servings at 189 calories each. These look awesome… do you think grade b maple syrup could bs subb’d for the agave or honey? I made these today and they were amazingly delicious. However, as many people have said the simply crumbled when I tried to take then out of the pan. I only used 3 cups of oats and added lots extra peanut butter and honey in hopes that it would do the trick. Nope. At least it still taste good. Awesome recipe. Was hoping to find the calorie content… any thoughts? These were amazing! i added a lot of extra nuts and dried fruits to the mix. I used honey instead. At first they were crumbling a lot. Then I reheated the first batch in the oven and as it was warm, I took it out and used waxed paper and pressed down firmly all over the top. The second batch came out perfectly after I pressed firmly during baking. Need to ask how this worked for you because it isn’t for me. First my natural peanut butter won’t melt. Second the batch is so dry that after baking it, it just fell apart. 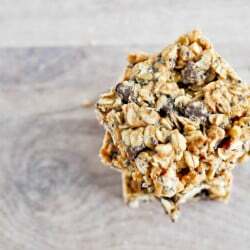 What’s the nutritional information for the basic 5 ingredient bars? Like calorie, fat, protein, ect. I thought your recipe looked delicious and wanted to try them out for myself. I had a couple of question regarding the caloric intake on these. How many servings does one batch make? And about how many calories are in a single serving? What are some of the nutritional facts about this recipe?